Mmmmm…that electricity sure smells good. The robots are starting to feed themselves. Marvin, the prototype from Intel Labs Seattle, can now plug itself into a wall outlet to recharge its battery. While not the first robot to plug itself in, Marvin does have the unique ability to sense the electric field surrounding the outlet. This electric field sense makes Marvin the first robot that doesn’t just feed itself, it also hunts for its own food. Check out the video from Seattle Times after the break. Getting a robot to return to a stationary docking port for recharging is a fairly standard accomplishment. Roombas and Rovios perform the task as a matter of routine. Moving the docking station, however, can disrupt the ability of these robots to recharge. The PR2 from Willow Garage took the recharging quest to the next level by plugging itself in to electric outlets it could recognize on sight. Marvin, who shares much in common with PR2 (more on that below), uses electric field sensing to help it find completely new outlets. This progression in electrical outlet hunting is really a progression in the autonomy of robots. Developers are coding self-servicing behavior into their bots, allowing for the possibility that these devices will one day be able to fully maintain themselves. Marvin’s routine for plugging in to the wall outlet currently relies on just a single sensor. This simplicity requires the robotic hand to make several passes to determine the exact location of the hot, cold, and ground sockets. With a more complex array of sensors, in development, Marvin should be able to find the outlet with fewer scans, perhaps even in the first attempt. The robotic engineers at Intel Labs Seattle were smart enough not to reinvent the wheel when it came to designing a robot. Marvin is really a hodge-podge of various other robotic technologies. He has a Segway base for mobility, a WAM arm, and a hand from Barrett. Although Marvin is equipped with a laser range finder, it isn’t used when searching for an outlet. This collection of diverse equipment works well together because the robot runs the ROS operating system from Willow Garage. Marvin is a great example of how an open source code like ROS can greatly accelerate the speed of research by allowing engineers to focus on the new task they want to develop. Of course, teaching a robot to recharge itself is just the first step in a long journey towards autonomy. 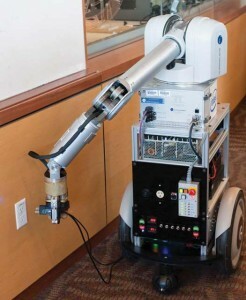 Eventually robots will need to diagnose damage to their hardware or software, and either repair themselves or travel to a maintenance facility. Full automation will also require robots that are built, installed, perhaps even designed by other machines. All along this path of development, robots will require progressively more complex sensors and reasoning capabilities. Hopefully other robotics engineers will take Marvin’s use of ROS as proof of the benefits that open source software and compatible hardware can have when trying to focus on sensing and programming. Working together robot designers can better equip robots to work by themselves.